There’s no doubt that many people come to Portugal in search of some serious beach time. And with plenty of sunshine to go around, the beach should definitely be on every visitor’s hit list. But what about the river beaches in Portugal? Although the coast definitely gets its fair share of attention, there are plenty of gorgeous rivers inland that are well worth a visit. Are river beaches really even better than visiting the seaside? In addition to being less well-known and just as beautiful as their coastal companions, river beaches offer lots of other great benefits. For starters, you can actually swim in them without fear of crashing waves or dangerous undercurrents. They also offer clean water and can be found in such a variety of settings that every day at the beach can feel like a completely new adventure. River beaches also have the advantage of offering natural shade and usually have cheaper dining options than the places you’ll find flanking the coast. If that sounds good to you— here are 10 of the most beautiful river beaches in Portugal. Located about 155 kilometres north of Lisbon, this beautiful lakeshore swimming area is a wonderful place to relax and unwind. Set amidst a picturesque landscape, here you’ll find everything you need for a fun-filled day in the sun, including a swimming pool, solarium, outdoor amphitheatre, restaurant, and spa. When it comes to river beaches, this one has it all. 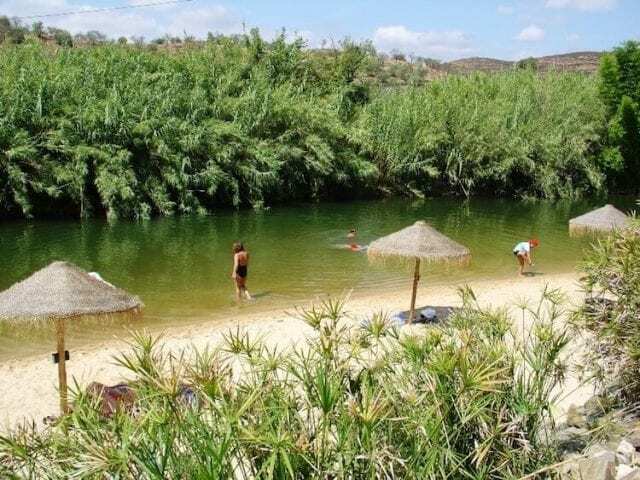 Discovering the beautiful Cascalheira river beach near Secarias, Arganil is truly a magical experience. On one side of the river, you’ll find sparkling sand coating the river bank and wooden benches scattered throughout majestic beech trees. You have several cafes to choose from when it comes to snacking, as well as a canoe rental shop and a well-maintained riverside path. This is also a great place to host a big picnic as you’ll find a covered cooking and washing up area. 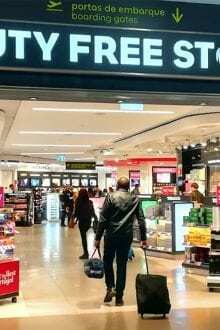 | Viseu is only one short trip from Arganil. Make sure you take at least an afternoon to visit this historical city. Another beautiful river beach located in central Portugal is Praia Fluvial de Foz d’Égua in Piodão. 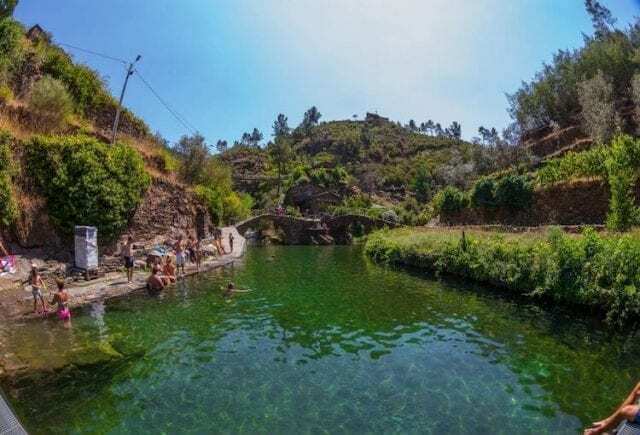 Set inside a lush valley where two streams meet, you can walk down to this secluded swimming spot from the hilltop village of Piódão. 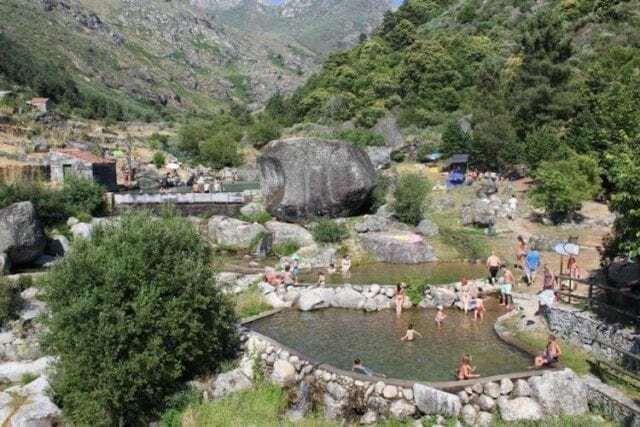 Accented by two schist granite bridges, this is an extremely romantic place to swim and makes a great way to end a hike in the region’s hills. 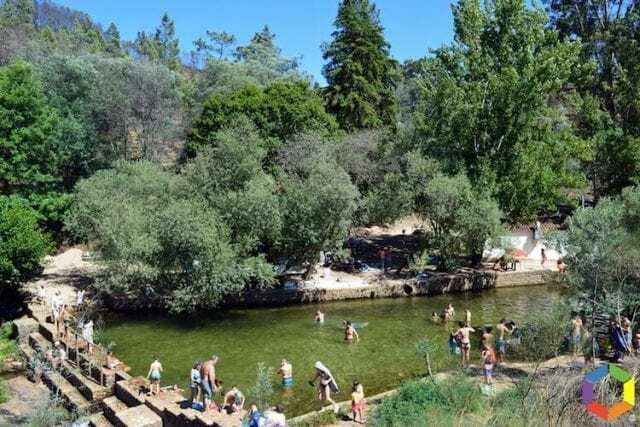 The perfect river beach in Portugal for the young, or the young at heart, this place offers rope swings upstream and shallow sandy islands downstream. Not to mention, there is a wilder wooded area farther up that is perfect for exploring. Decked out with all the amenities, there is even a river-side bar suspended over the water, so you can dip your toes while you enjoy an afternoon refreshment. | Have you been to Coimbra? Less than an hour away you can find Portugal’s most famous student town and it’s definitely worth a visit. 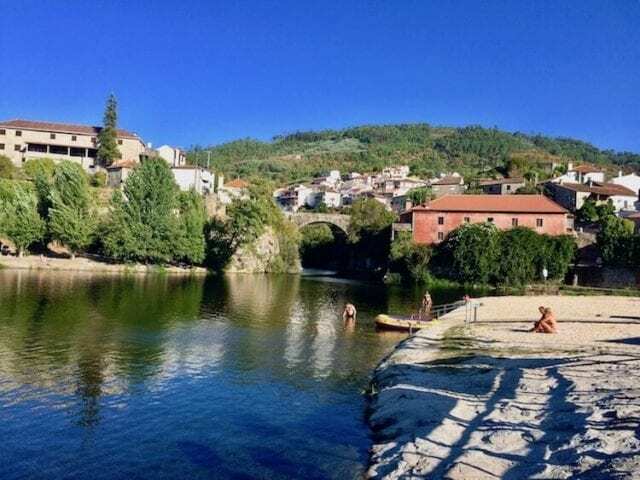 Located in the stunning Serra da Estrela Natural Park, this river beach is located about 180 kilometres from Porto and is truly worth the trek to get there. The only river beach in Portugal set in a glacier, the surrounding landscape is breathtaking, and the water is crystal-clear. If you’re in search of a unique natural sanctuary where you can take a swim, this is your place. 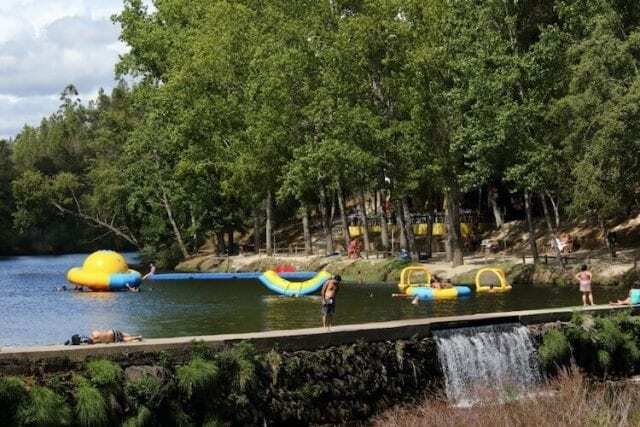 Like many of the river beaches in Portugal, it also offers plenty of sanitary facilities, bars, picnic areas and a children’s playground. 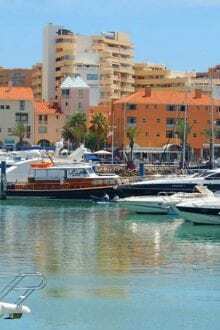 Farther north, close to the border with Spain, you will find Praia Fluvial Da Ponte de Soeira. About 225 kilometres away from Porto, this is one of the more rustic and uncultivated river beaches in Portugal. The quality of the water is basically unmatched, and you can float calmly in a small natural lagoon. There are a couple of bars to get refreshments and plenty of opportunities for exploration in the surrounding area. If you didn’t think Portugal could offer you an idyllic mountain village with a fresh river swimming hole — think again. At this special place, river Alva and Alvôco riverside, converge under the arches of an old stone bridge. To better explore the area, you can hire a rowboat or if it’s a thrill you’re after, there are rope swings that are sure to get your heart pumping. The water is as clear as clear can be, so you’ll be able to appreciate all the colourful fish you’re sharing a swimming space with. 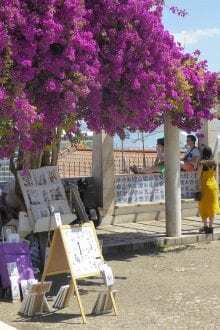 | Don’t miss out on the best tips and advice from expats and locals living in Portugal. Subscribe to our newsletter today! 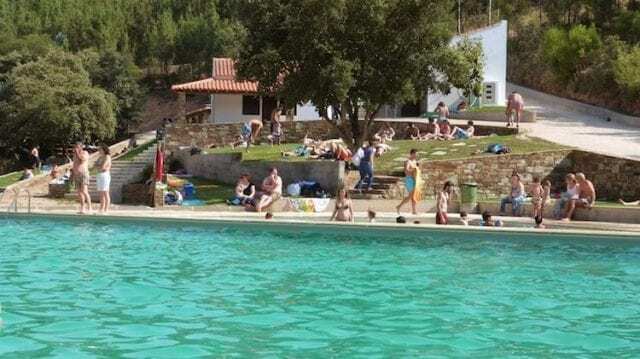 For those in search of a beautiful river beach in Portugal which still offers complete access to modern conveniences, this is the place for you. During the summer, this beach in central Portugal even has a lifeguard service, so it’s a great place for the whole family to swim and explore. They also have large areas of grass to play on, picnic areas, two covered barbecues and a bar that serves the river beach. 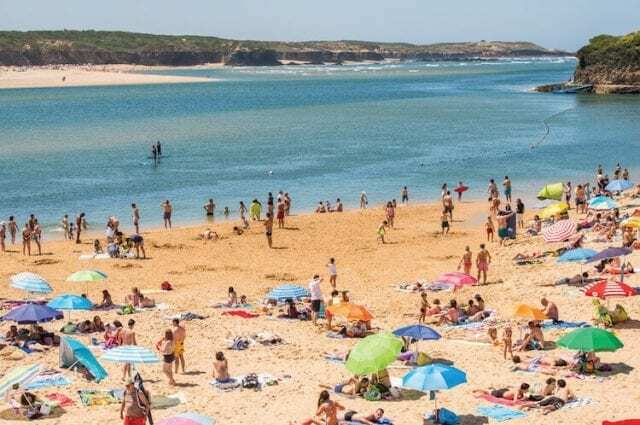 Heading south, you’ll find this fun river beach in Portugal about 95 kilometres from Faro, just next to the Spanish border. A great place to spend the day with the family or a group of friends, this beach offers all the amenities and even has space to do different activities, like play volleyball or beach soccer. This special little beach is located along the sandy banks of the Mira river as it meets the sea. For those looking for a river beach in Portugal that also has access to the open ocean, this is the place for you to explore. 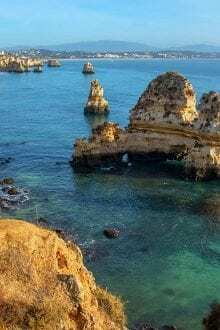 It is located close to the ancient fishing village of Vila Nova de Milfontes and the rivers offer calmer swimming conditions than the waves that can be found farther out. Here you can try canoeing or simply just enjoy basking in the sun. Is it worth it going to the river beaches in Portugal? If you want to avoid the crowds and if you’d like to have a more unique adventure, going to a river beach can be a really fun weekend activity. With the summer right outside our door, there are dozens of beautiful places like these around the country which you should definitely explore. So yes, this experience is definitely worth it! I’m a Lisbon-based writer who loves talking culture, travel, and women’s sports. 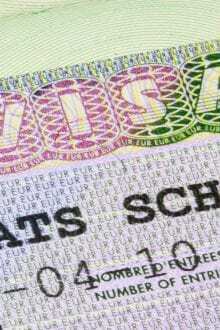 Born in Canada, I completed an MA in Humanities in Prague and a Journalism Diploma in Montreal. I’m always on the hunt for surprising stories and new ways to #resistapathy.